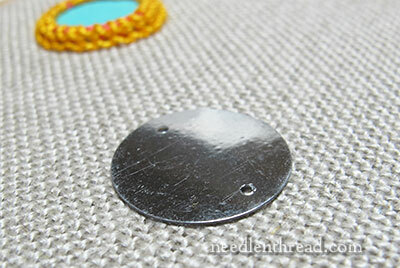 Last week, when we started playing with shisha stitch as part of the Stitch Fun series, I didn’t really go into detail about shisha mirrors. 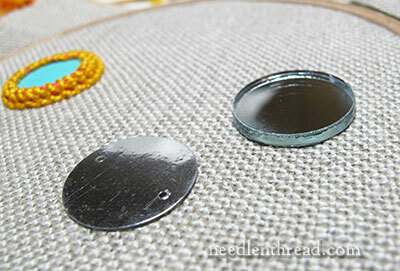 But, since many of you expressed an interest in the stitch and doing some “real” shisha embroidery with mirrors, I thought we could chat a bit about types of mirrors and resources. Whenever I’m looking for a needlework item that is somewhat obscure, I start at the website of a store called Lacis located in Berkeley, California. I visited Lacis several years ago while on a road trip, and really – if you ever have the opportunity – it is a Must for needlework enthusiasts. It’s a crazy-wild store full of everything, from European books and magazines on needlework to every kind of thread, lace, obscure and not-so-obscure tools, beads, accessories … they’ve pretty much got it! They’re very flat. They’re very light. They’re somewhat flexible. They’re punched with two holes so that you can fix them to your fabric first with tacking stitches and then work the decorative edge, or you can string them together, overlap them somewhat like sequins, and the like. 1. They have practically no height to them, so you miss the “chunky” look of shisha embroidery that’s worked with real mirrors. 2. The mylar-type stuff scuffs easily, so you also miss that very clean, clear mirror effect that comes with real glass mirrors. Still, they do reflect and catch light – they just don’t do it the same way and to the same extent as real glass mirrors. Here’s the difference in height between the mylar substitute and the real glass mirror. 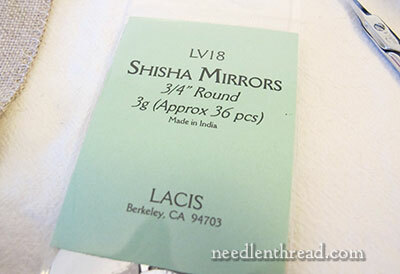 Incidentally, the real mirrors that I’ve bought from Lacis (search “mirror” in their catalog, not shisha!) are smooth on the edge and require no honing. They’re ready to go. 1. They’re more expensive for the quantity you get. 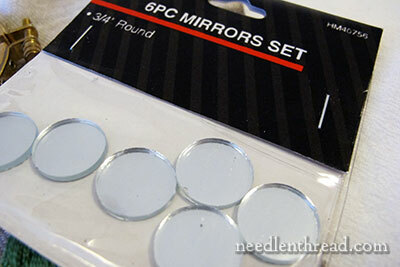 For the 3/4″ round mirrors, you get 6 mirrors for $1.60. For the thinner plastic substitutes, you get about 36 for $3.00. So you end up paying about three times as much for the glass. 2. The glass mirrors are heavy. If you’re thinking in terms of wearable shisha embroidery, this could be problematic if you want a lot of shisha on whatever you’re wearing! But for small accessories, for small ornaments, for a little touch of shisha embroidery here or there, one or two glass mirrors aren’t so bad. Above, you can see the mylar-like substitute on the left, the real glass mirror in the middle, and the acrylic mirrors that I showed you last week on the right. You can see that the acrylic is significantly thicker than the regular mirror. For me, this thickness is a drawback. It is more difficult to work traditional techniques over the very thick acrylic. Still, the thick acrylic has its uses, and can be fun, since it’s available in so many shapes. Above, you can see my demo disks made from mat board and colored paper right next to a regular mirror. They’re the same thickness, which works out really well if you want something inexpensive to practice with. I made these by using a 3/4″ hole punch, a scrap of mat board, some colored paper scraps, and some strip glue – all of which I had on hand. It took about 3 minutes to work up a good pile of them to use for demonstration. 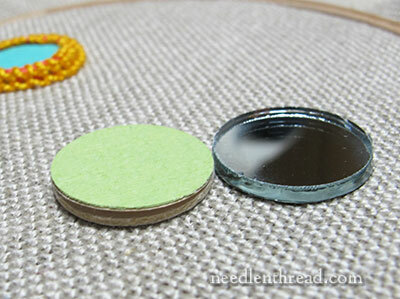 If you have the supplies on hand, this is an inexpensive way to practice shisha embroidery. All that being said, shisha embroidery can be worked with all kinds of other things, too, from buttons to coins to metal disks, washers, and the like. Erica Wilson mentions cutting out card and covering it with heavy duty aluminum foil. I’ve seen pennies figure in shisha embroidery quite a bit, and buttons. Think flattish and round, and try anything that fits the bill! Shisha can also be worked over square and diamond shapes, and you can find these shapes available in the mylar mirrors at Lacis, too. 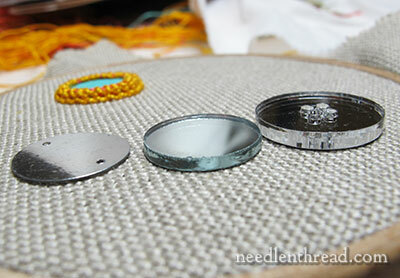 Finally, one of the reasons I’m touching on shisha embroidery right now (besides the fact that it’s just fun!) is because shisha makes a nice simple decoration on a basic ornament, so it’s a fun way to whip up little ornaments to use for decoration or gifts, if you’re thinking in terms of Christmas stitching. We’ll look at some variations on shisha embroidery later on using different stitches and threads. If you’re keen to try other stitches besides the traditional shisha stitch, keep an eye out! I have just tried doing this and enjoyed making my first shisha embellishment. I like your tutorial which is very complete. Looking forward to more instruction from you! Interesting. My neighbour has a wonderful tablecloth that I now know is worked in shisha, so even if I never actually use your information, I’ve learnt something! Again, thank you for another Shisha post. I agree about the weighty-ness of real glass. Oftentimes I work on imported Indian wear and they not only use real glass and mirrors, they also use full shells and stones. The clothing is very heavy; not to mention FULL of embroidery floss! I agree that Shisha make lovely decorations would be great for Christmas ornaments. Thanks for showing us the different types of Shisha mirrors I expect they both have their uses but I also like the idea of using other objects for Shisha the mind is buzzing of what could be used other then mirrors I like your mat boards. I’m still embroidering the Little things so that is taking all my time at the moment but I must try Shisha I like the idea and the stitches. Thanks for sharing this with us. I have found small mirrors in different shapes suitable for Shisha at dollar stores in the craft department. That is funny, those just look like paillettes, penny sequins, with an extra hole to me. They’d be so dull right enough, I’d rather go with the mirrors. Years ago I made and embellished a handbag using shells, sea glass, and shisha-style stitching. The shapes were irregular, but the process were the same. The product was very informal but fun to do. I wonder if other readers have tried something like this. I’m here in Pune, India for an extended stay as an expat. I’ve only seen the thick mirrors in “antique” older works. Mostly hangings made from the scraps of even older textiles. Shisha worked for contemporary wearables (even very expensive quasi Couture ones) uses Mylar or plastic mirrors. I’ve even seen cut up CDs and DVDs used as mirror bits in less expensive for-tourist items. I haven’t asked after the glass mirrors yet in the needlework shop, but when I go again I will, then report back. 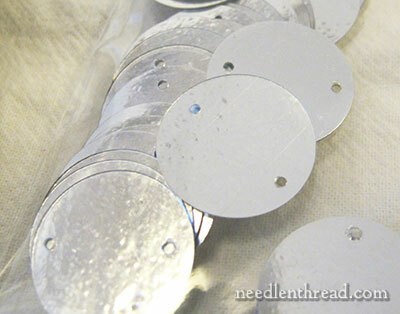 -k.
Another option if you have access to the appropriate tool is to cut circles from old CDs. My Dearly Beloved has done this for me and it works quite well. There is some reflection, albeit not the sharp type that comes from a real mirror, but they are also light-weight. They are a little thinner than the mirrors but you could glue two together if you wanted the extra height. To cut them out you will need a hole saw of the appropriate diameter. I haven’t done this yet but there is no reason you can’t simply cut diamond/lozenge or square shapes out of the discs. Cortar los CD es un recurso ,también cortar un circulo de cartón fino y forrarlo con el papel aluminio de la cocina. Gracias por enseñarme tantos puntos. I don’t know about in the states, but in the UK you can buy Shisha mirrors in many shapes pretty cheaply from Hobbycraft – our chain craft shop. Thank you for the perfect information about shishas and so on. Next Next post: Thread Talk: Cosmo Sparkling Thread!